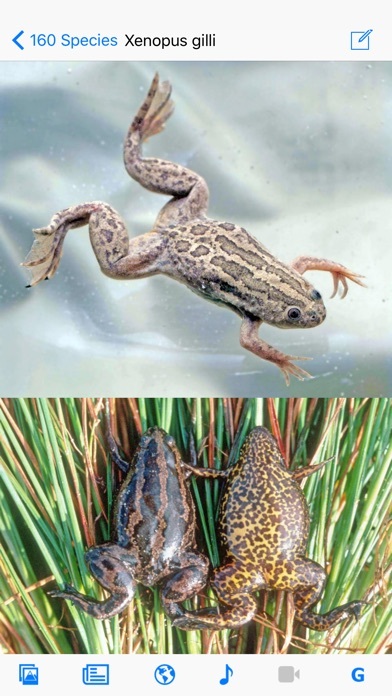 Frogs of Southern Africa is a beautiful and authoritative app authored by zoology professor Louis du Preez and environmental consultant Vincent Carruthers. It is the definitive guide to frog identification in southern Africa and is suitable for nature lovers of all experience levels. 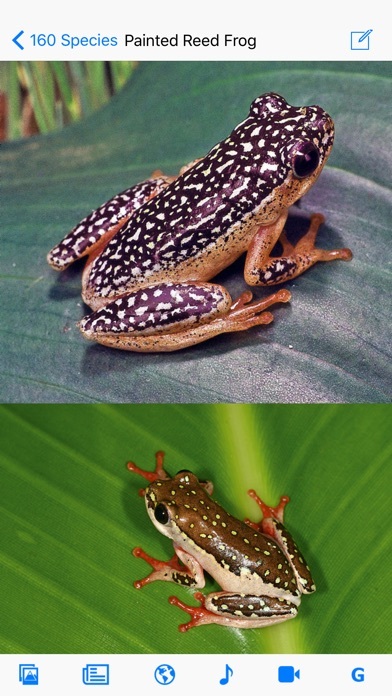 Intuitive and accessible, the app introduces the user to all 160 frog species in the region. 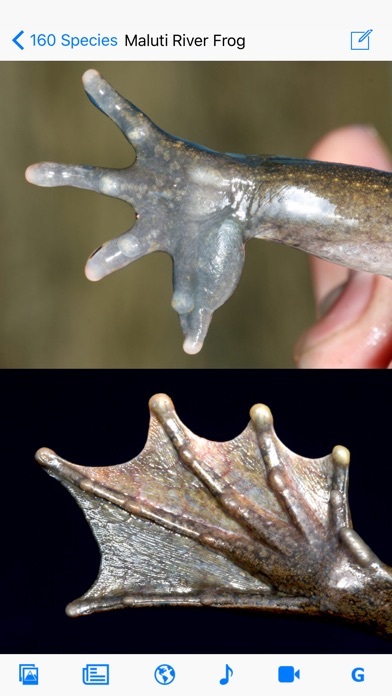 The species, with their tadpole stages, are comprehensively described, covering conservation status, calls, distribution maps, habits, habitats and key ID points. Full-colour photographs and high-definition videos show behaviour, mating, habitat and calls. 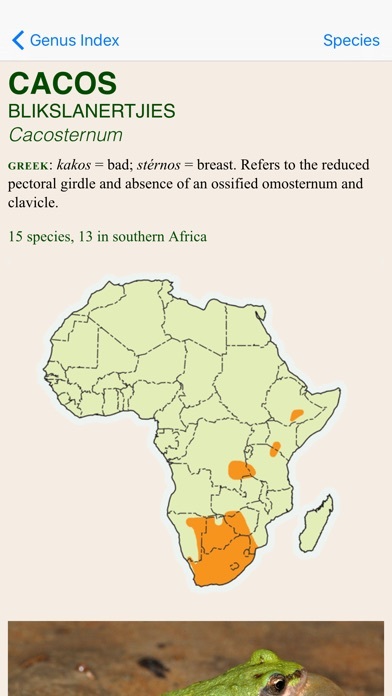 The genera are also fully described and illustrated, and a 'Distinctive characters' feature provides key information at a glance. Spatial data and a simple identification key help to narrow down search results, increasing the chance of accurately identifying these secretive and often cryptic creatures. This app is suitable for all nature lovers, amateur froggers, students and professional scientists. ** Apart from the initial download, no internet connection is required for the app to function. 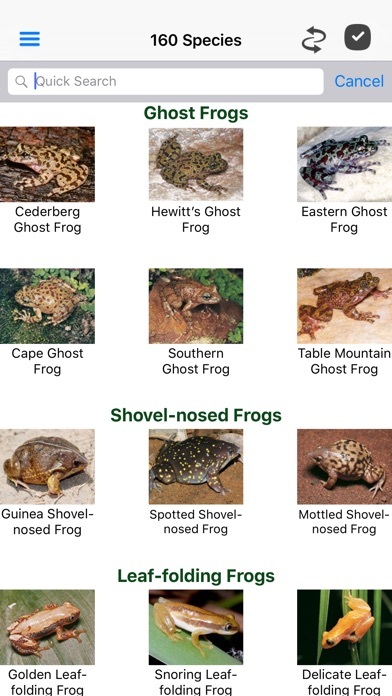 ** FEATURES ● The most comprehensive app on the frogs of southern Africa ● Covers all 160 frog species (and their tadpole stages) in the region ● Packed with accurate information written by leading experts in the field ● Uses spatial data and a simple key to narrow down search results and accurately identify a species in its natural habitat or in a laboratory ● Describes frog and tadpole biology and behaviour, habitats and conservation status ● Allows users to compare two species side by side on the same screen ● Features a personal frog list for storing sightings on the device*, with an option to export the list via email ● Includes 150 frog calls ● Multiple high-quality photographs per species and genus ● 61 High definition videos ● View frogs by using English, Afrikaans or scientific names ● No collection of personal/location data, in-app purchases or advertising *Uninstalling the app will result in the loss of your list. It is recommended that you keep your own backup (master list) separate from the program.